San Fran Explored and Viva Las Vegas!!!! Boy, oh boy! This was the trip I was most looking forward to – and wow, did it live up to expectations! Our first stop was SF, and once we touched down, I was mesmerized! For those of you who don’t know, staying in the main part of SF is quite heavy on the wallet, so Renato and I stayed near San Leandro, since that’s out of the city (and cheaper too). I didn’t mind it at all since the place was simply exquisite, away from the hustle and bustle of the main city, and the subway was always a peaceful journey to and from the main city area. There is so much to see at this location you could take weeks to see it all. Renato and I walked along the wharf, while taking in the view of the San Francisco Bay and Alcatraz. Fisherman’s Wharf is a fun place along the bay. There are tons of places to eat; along with shops and other activities. In fact, check out the below pictures we clicked. You can rent bikes, go on tours, shop, eat and see amazing views of SF –we went on one of the boat tours to the Golden Gate bridge and the majestic feel of the breeze running through your hair only pales in comparison to the wonderful sight of the Golden Gate bridge that dwarfs everything and everyone on and below it. It’s been seen in so many movies, but what you see in person (so to speak) astounds you. You can go down the base and see where Kim Novak jumped into the bay in Hitchcock’s Vertigo, there’s also a footpath along the Bridge on which tourists walk across, though it tends to get quite cold and foggy in the winter. Unfortunately we didn’t get to go on the island (mainly since booking closes around 3 months prior- yea! Be sure to book your tickets 3 months in advance) but we did get to pass it while on the boat to the Golden Gate. I read online that a visit to Alcatraz exceeds all expectations and they have an audio tour that does a great job of describing the Prison Life and some of the historical highlights of Alcatraz. If you’re planning to visit The Rock, definitely buy your tickets in advance. 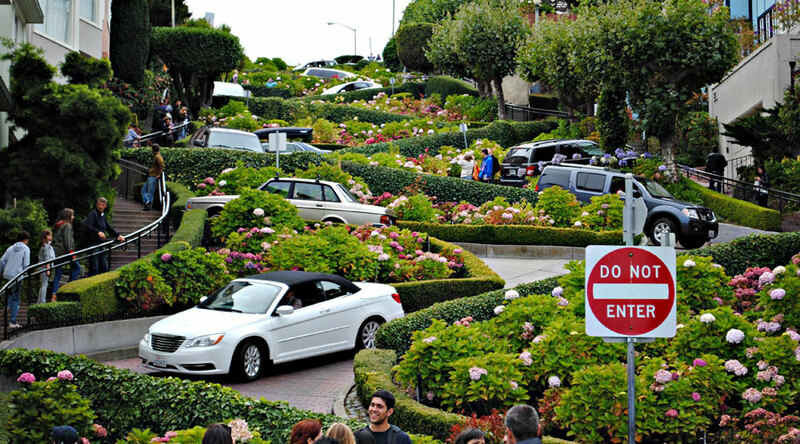 Everyone that visits San Francisco needs to both, drive and walk the curves of Lombard Street. The views are spectacular and the home architecture splendid. There are also a number of nice restaurants and coffee shops close by. However, side note, I didn’t find it much different from Bombay – in fact, I’m quite certain that travelling to Linking Road in an autorickshaw at 8pm is far more deadly than doing anything on Lombard Street. It’s just a maze of curvy and twisty streets roads (the same as ZigZag road in Bandra) and isn’t all that interesting. The street, and the difficulty of driving it, is parodied in the Bill Cosby sketch “Driving in San Francisco” on the album Why Is There Air? The Cable Cars are a classic….and not a bad way to take a quick look at many of the major areas within downtown San Francisco. Definitely a classic way to see a beautiful city. Get the all-day ticket and enjoy the rides and views. The cable car men are really friendly (and you should see how they manually have to turn the cable cars around at the end) and put on a fun show with the ringing of the bells. The sight of the up and down roads is truly spectacular to see. The ride from downtown thru North Beach to Fisherman’s Wharf is well worth the time. Just a word of caution, since SF is very touristy and there are so many students that study here, you might have a tough time waiting in line to hop on the trains (Reno and I waited for almost 2 hrs the first day to board the trams, and the entire journey lasted all of 20 minutes). I would recommend hopping on at night, since it’s less crowded and quicker to board. Walking the Embarcadero (one of the main business areas) is a great way to see the waterfront. It is a very nice, safe area that you can walk for a long way and enjoy the sights and sounds of the waterfront. We took the cruise that took us to Sausalito- not much to see there, though it’s quite scenic and beautiful to look at. At the embarcadero, there are a lot of tourists, great coffee shops and multiple cruises that you can board to take you past the Golden Gate Bridge to the other side. In fact, if I remember correctly there was even a statue of Gandhi there. Too good! !